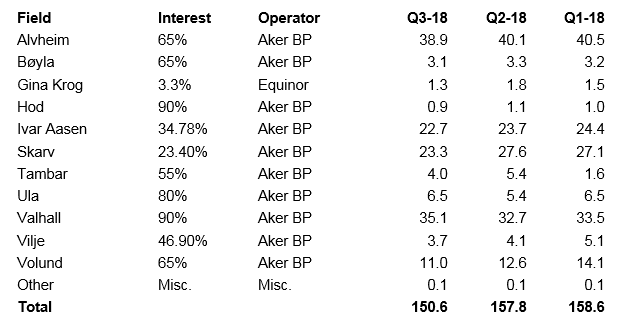 Aker BP ASA produced 150.6 thousand barrels of oil equivalents per day (mboed) in the third quarter 2018. Production in the third quarter was impacted by planned maintenance activities at Skarv and Alvheim, as well as temporarily higher gas injection and hence reduced exports from Skarv. As part of the Valhall IP drilling campaign, the company has tested a new well stimulation method which is expected to significantly reduce the time and cost of new wells. The testing has taken more time than anticipated. As a result, some of the production growth that was expected from Valhall in the third quarter has been moved to coming quarters. The production per field is specified below. Production volumes are subject to final re-allocation. Numbers may not add due to rounding.